The friendly and experienced team at Dentures at Clayfield make dentures to suit your needs. Located in the heart of Clayfield, north Brisbane, our brand-new denture clinic is fully equipped with the resources and modern technology to create custom-fitted dentures. Here at Dentures at Clayfield we aim to provide you with dentures that suit you aesthetically as well as being functional and comfortable to wear. We achieve this by taking the time to listen to your concerns and provide the highest-quality denture devices perfectly suited to your needs. As we have our own onsite laboratory, we are able to control every stage of the denture manufacturing process. This ensures the highest level of craftsmanship and quality of materials to bring you a superior denture. We specialise in adjustments, cleaning, customising, denture repairs, precision dentures, relines and replacements. So whether you need a new set of dentures, a reline or repair, we can help. Dentures are custom-fitted false teeth designed to replicate the function and appearance of missing teeth. Whether you’re missing a single tooth, multiple teeth or the full arch, we have a range of denture devices to meet your criteria. We provide full dentures, partial dentures, denture relines and denture repairs. A full or complete denture replaces all your natural teeth while a partial denture replaces your missing teeth with an acrylic or metal framework resting on your remaining natural teeth. New dentures take a bit of time to get used to, so don’t worry if they feel strange at first. It will take a little time for you and your mouth to adjust. We will take great care to make your dentures fit, but they may require slight adjustment in the first week or two while the dentures seat themselves. Minor sore spots or tenderness usually heal in a day or so. If soreness persists, you should make an appointment to come in and see us. If you have left your dentures out due to soreness, wear them for at least 24 hours before your appointment to help us pinpoint the problem area. Appearance: Most dentures made with today’s technology look very natural and other people can’t tell you are wearing them. However, you may feel your teeth are more prominent and your lips are fuller. After several days, your facial muscles will relax, your dentures will seat themselves and your face and mouth will have a more natural appearance. Speech: You may experience some speech difficulties during the first few days. Your new dentures will feel different from your natural teeth or from your previous dentures. Dentures also affect your tongue’s movements. Once your tongue gets used to the new dentures, speech will return to normal. Speaking or reading out loud and in front of a mirror will help you get used to your dentures. Sense of taste: At first, food may taste a little different. This is just your mouth adjusting to the feel and texture of your new dentures. Food will soon start to taste normal again. Nausea: If you feel nauseous after inserting your dentures, relax and breathe in and out through your nose. Usually this feeling will pass and you should continue to wear your dentures. If it is an ongoing problem, contact us, as an adjustment of the dentures may be necessary. Eating: It is likely you will experience some difficulty eating when you first receive your dentures. It is common for a lower denture to move a little due to the action of your tongue, cheeks and lips when chewing. With practice, you will learn to control the movement of the lower denture. After dentures: What to expect? Avoid foods that require you to bite with your front teeth, such as whole apples and crusty bread. You can attempt these foods when you have mastered your new dentures. Can you wear dentures all the time? Wearing dentures at night is a personal choice. If you feel more comfortable sleeping with your dentures in, then do so. However, if you experience frequent or long lasting tenderness of the gums, rest your mouth by leaving your dentures in water overnight. Wearing your dentures at night for a few weeks may help you get used to them more quickly. Partial dentures should not be worn at night. Like natural teeth, dentures attract plaque, become stained and collect food particles that can cause bad breath or irritate your gums. Keeping your dentures clean is vital for good oral health. Whenever possible, your dentures should be cleaned immediately after eating. If you are away from home, rinse the dentures under tap water. Clean your dentures at least twice a day. The best cleaning method is a combination of brushing and soaking. Brushing: Use a small soft nailbrush with natural bristles (not nylon) or a denture brush to brush your dentures. Abrasive material can damage dentures so use soap or non-concentrated dishwashing liquid. Do not use toothpaste. Soaking: Soaking does not replace brushing but helps to clean difficult-to-reach areas. Commercial soaking agents are available from supermarkets and pharmacies, or you can make an inexpensive alternative at home by mixing equal parts of white vinegar and water. After soaking, thoroughly brush and rinse dentures in water. Don’t use hot water as it may adversely affect the denture material. To protect your oral health, you also need to look after your gums, tongue, palate and any natural teeth. Brush gums, tongue, palate and natural teeth gently twice daily with a soft bristled brush. This stimulates circulation in the tissues and helps remove plaque. Regular dental checks are also important to monitor the health of the soft tissues in your mouth and diagnose other conditions. Dentures are fragile and may break if dropped. Handle dentures over a folded towel or sink filled with water. Dentures should be kept in water when not in the mouth to prevent the denture from drying out. Take care with delicate partial dentures to prevent breakages. Avoid undue heavy biting on individual front teeth. Make sure clasps fit accurately so they do not rub or wear teeth, and make sure clasped teeth are cleaned well to avoid decay. See your prosthetist if the denture breaks, chips, cracks or becomes loose. Worn out or ill-fitting dentures can cause permanent damage, affecting both your dental and general health. 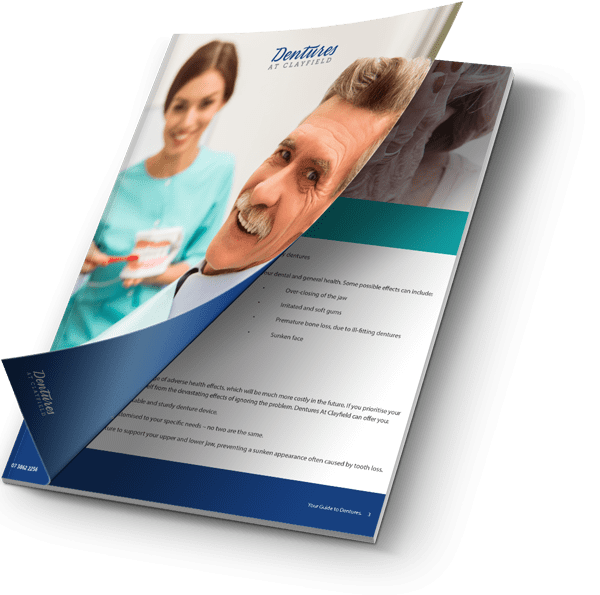 If you’re experiencing any of the following possible effects, it’s important you seek immediate attention from the professionals at Dentures at Clayfield for an assessment. An important thing to note is that when you receive dentures from us, they have been designed and sculpted to a very particular standard and one that fits you like a proverbial glove. Using our onsite laboratory, we can create dentures that are both comfortable and natural-looking and that after an initial period of adaptation, will fit in seamlessly with your smile. As for how dentures will affect your appearance, they have the ability to completely transform your smile and even help you with the functional aspects that may be lacking due to missing teeth. Should you have a removable denture, then we strongly recommend that you take them out every night before bed and keep them in a glass of water or a cleaning solution after giving them a gentle brush with a soft bristled toothbrush or a specialised denture brush. Your remaining teeth should be treated much the same as any teeth and require you to brush and floss them daily to avoid any additional teeth being lost. If you have had implant retained dentures fitted, then you can also treat them in the same way as you would your natural teeth with daily brushing and flossing. You can even add an antimicrobial mouthwash to this routine for improved results. Can I eat all of my favourite foods? Naturally, when you have dentures fitted there are certain sacrifices to be made with regards to your diet. The reason for this is because as much as we would love to be able to create indestructible dentures it’s simply not possible and there are some foods that could damage your prosthetic, put you at risk of choking or causing your denture to shift. Most patients can expect an improvement of up to 30% in their chewing range and if you have implant-retained dentures fitted this number could increase to as much as 70%. Unable to make it in to see us? We offer a convenient mobile denture service in Clayfield. If you are unable to make it into our clinic, we can come to you. We visit retirement villages and care facilities, so if you or a loved one would like us to come to you, please let us know when you book your appointment.